Upgrade flew largely under the radar when it came out last year, which is a shame. So, I am doing my part to get it a wider audience by reviewing it. 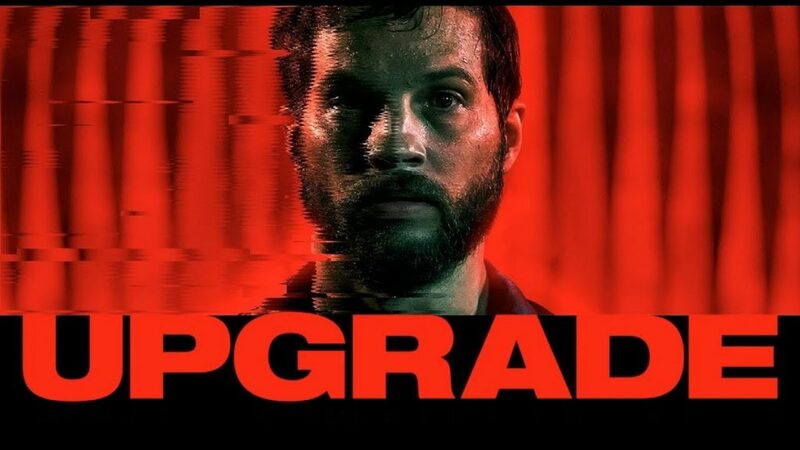 Upgrade is a near-future cyberpunk/action/horror film written and directed by Leigh Whannell and produced through Blumhouse. The story follows Grey Trace (Logan Marshall-Green), a mechanic that specializes in restoring vintage cars. After delivering a car to high-tech billionaire Eron Keen (Harrison Gilbertson), Grey and his wife Asha (Melanie Vallejo) have their car hijacked, leaving Asha dead and Grey paralyzed from the neck down. Eron approaches Grey in the hospital with an offer: he has created a microchip (called STEM) that will allow Grey to regain his mobility. However, as the development is not cleared for human experimentation, Grey will need to keep it secret. He agrees and receives the chip, whereupon he learns STEM’s artificial intelligence can communicate with him and, with his permission, assume control of his body. The AI (voiced by Simon Maiden) helps him to track down the attackers and under STEMs control, he becomes a hyper-competent fighter. The movie becomes a race for Grey to learn why he and his wife were targeted for attack, while staying ahead of Eron, who is not pleased with how Grey is using STEM. The attackers, led by Fisk (Benedict Hardie), are hunting to learn who is taking them out. And then there is Cortez (Betty Gabriel), the detective investigating Asha’s murder. She suspects Grey is killing Fisk’s men despite appearing to be a quadriplegic. Leigh Whannell, best known for writing the Saw franchise for James Wan, has branched out from writing to directing. He brings a distinctive visual feeling that shows influence from Wan, while still remaining original. Made on a typical Blumhouse shoestring budget of $5 million, every cent shows on screen, from the near-future cyberpunk aesthetic to the brilliant cinematography whenever STEM assumes control of Grey’s body. The movie is paced like an action film but builds tension like a horror film. The cyberpunk setting is handled well. There is no year given, which will help the movie from dating itself too much. The advancements we see – self-driving cars and voice-activated devices making meals and helping around the house – are excellent extrapolations of current tech. This helps to ease the audience into the more advanced tech that drives the plot. As the lead, Logan Marshall-Green does an amazing job. Due to his resemblance to Tom Hardy, there are some inevitable comparisons, but by the end of the film Marshall-Green’s abilities truly shine through. He conveys Grey’s frustration and grief, but also plays his shock and confusion when STEM is in control and performing some truly impressive choreography. Betty Gabriel, best known as the maid in Get Out, does a good job as Cortez. She does well in showing her simultaneous confusion at how Grey could possibly be taking out trained killers from a wheelchair and her certainty that he is doing it. Harrison Gilbertson is serviceable as Eron. The character is meant to be creepy, which he brings across, but there is not much else to the character. Benedict Hardie’s Fisk is the weak link in the acting. He is never anything but an over-the-top fanatic. This is very evident in scenes with Marshall-Green who brings a much more nuanced performance. Simon Maiden manages to steal the movie as the voice of STEM. He manages to be sympathetic and menacing, often at the same time. I give Upgrade a grade of B. It is a solid movie that genre fans will embrace whole-heartedly. Non-genre fans should still enjoy it for the tight action and pace.